Templiers still successfull in EFAF Cup ! The come back of the 2005 EFAF Cup vice champion has been very positive, we saw great focus and execution in the first half from the Templiers. The second half saw the Templiers defense play very good with a productive 6 turnovers and gave good field position to his offense which sadly didn't find the way to score any points. 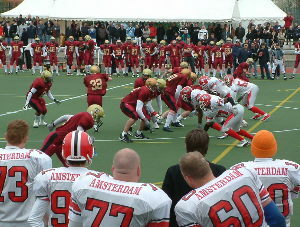 Now the Templiers are getting ready to play against the Zurich Renegades Saturday 29th of April and will try to reach the EFAF Cup 2006 play off.